We all know the feeling of returning home from a long trip. Whether it's air travel or a road trip, the post-travel days can feel like a drag. Your body is out of whack, your schedule is thrown off, and you seem to have double the work and household chores to catch up on. On top of that, you're probably trying to catch up on sleep you missed out on when you were en route. Not to mention those post-travel blues can be very real. I just got back from Brazil a few days ago, and it was one of the most thrilling trips of my life. I was sans kids, so not only was the cultural experience incredible but so was the time to reflect and be alone with my thoughts. Of course, I was overjoyed to see my husband and children upon my return, but I also hit the ground running with writing deadlines, reconnecting with my family, normal household chores, and the dreaded unpacking. Yes, the solution for everything in life. Drink more water. But in all seriousness, this is a very important travel recovery strategy for me. Often during transit, you avoid drinking as much water as you normally do because you don't have access to a bathroom whenever you need it. The air in a plane in dry and intensifies your thirst. Consuming tons of water helps me to flush out the harmful effects of travel, the rich foods, the toxins, the exhaustion. Adding lemon to my water even perks me up and makes me feel a bit more energetic. It also curbs my hunger when I want to continue to snack like I was on vacation. Often I get back from a trip and realize I have hundreds (if not thousands) of photos and videos to sort through. That can leave me feeling paralyzed and overwhelmed, so I just avoid them altogether. It's important to remember that you took those photos and videos for a reason. The moment felt special to you and you wanted to remember it. You thought a certain picture would resonate with a friend or family member. You wanted a digital keepsake of your trip. Edit your photos right after you get back, perhaps while relaxing and watching Netflix. It will give you small boosts of happiness as you go through them, recalling sights, sounds, and smells from the trip. It will also ensure that you have these memories for years to come, whether that means you printed them to hang on your wall, put them in a blog post, made a Shutterfly book, or simple an album on Facebook. I'm currently dealing with a backlog of videos I've been taking all summer from various travels, and let me tell you from experience. The longer I wait to edit the videos, the more overwhelming it seems. Do it right away! The fresh air and grounding your feet to the earth will do wonders for your energy, well being, and sleep cycle. It gets you away from screens and enjoying your familiar surroundings. A nice long walk will help get your blood circulating again after sitting on a plane or in a car for so long, too. It's still insanely sweltering here in Florida, not to mention rainy season, so we take the small pockets of bearable weather when we can get them. Early morning walks or early evening games in the yard have been lifesavers for me. Something that's been fun for us is playing the Brazilian beach game I brought back from my trip. It's a simple paddleball game hitting a ball back and forth, and the kids are terrible at it (bless their hearts), but we all end up giggling together as we chase after errant shots. It gets my feet on the ground, the wind on my face, and lots of quality time with my kids. Have you ever made the mistake of dressing how you feel? I have. After a trip, all you want to do is stay in your pajamas and curl up in bed watching Prime Video. You end up dressing in sweatpants, which makes you feel tired and sloppy. Your productivity goes down the drain. Not ideal when you have so much to do upon your return. I've learned my lesson, and now I dress how I want to feel. I pick outfits that are still very comfortable and allow me to chase my kids, sit on the floor with them, and play at the park, but they are still acceptable clothes for being in public - NOT sweatpants. I do my hair, put on a little bit of makeup, and get dressed. I feel ready to conquer the day, my deadlines, and my unpacked suitcase. I find myself reaching for my outfits from PinkBlush when I want to look nice while feeling comfortable. I've always been a fan or their maternity line, but their Women's Clothes are always on-trend, too! The material is always so soft and makes me feel like I'm wearing pajamas even when I'm not. 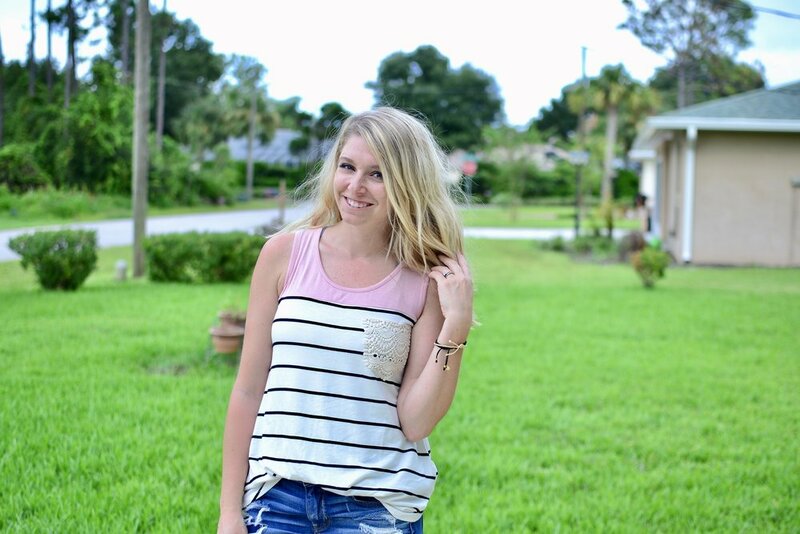 This Colorblock Striped Crochet Pocket Top is the perfect cute & casual tank to wear with denim shorts for a relaxed day at home with the kids (or a last-minute trip to Target). It's a little longer on my short torso, so I added the half-tuck to make it look a bit more put-together. If we ever get some cooler days here in Florida, I picture it being so cute with skinny jeans or leggings and a warm cardigan. It passes all of my criteria for a stay-at-home-mom wardrobe staple: comfortable - check! stylish - check! wouldn't embarrass my daughter at school dropoff - check! (And for my pregnant and nursing mamas out there, this can actually work before, during, and after pregnancy, too, so it's a great piece to have on hand for all stages of motherhood). Maxi dresses are a dream for moms everywhere. They are the dress version of yoga pants, and so comfortable I might as well be in pajamas. This Navy Blue Floral Short Sleeve Maxi Dress is perfectly cut to hide postpartum pooch or diastasis recti if that's something you're trying to figure out how to dress for. It's not quite an empire waist, which can make you look pregnant even if you're not, but it provides enough flowy material over the midsection to mask anything you don't want to be highlighted. I'm in love with the rich navy blue color of this dress, along with the floral pattern. We all know that dark colors and patterns cover a multitude of child-related stains! This maxi is so comfortable I think I'm going to wear it on a cross-country plane ride by myself with all three kids in a few weeks. Even though I'll be frazzled on the inside, I'll at least look cute and put-together while I'm doing it! This is also a great maternity and postpartum options, although I wouldn't necessarily recommend it for nursing moms since the neckline is so high. Whether you're suffering from jetlag or not, it is so necessary to get a good night's sleep to recover from long travel days. Your body is fighting off germs and is already lacking sleep. To make sure you're getting the rest you need, turn your bedroom into a sanctuary and give your body cues that it's time to sleep. I like to dim the lights in my room, diffuse some lavender essential oil, pamper myself with a warm shower or a creamy moisturizer, take my favorite pre-bed concoction, and climb into bed with a good book. I'm usually drifting off to dreamland within minutes. If you're feeling overwhelmed with all you have to do after a long trip, take pen to paper and write down your to-do list. Physically writing it out is calming, and forces you to slow down and think. (Plus I like the feeling of crossing something off when its done). This tip isn't just about to-do lists, though. You can also write down journal entries from the trip, an outline of what you did, or the names of restaurants or attractions you loved and would recommend to others. You think you'll always remember the name of the place where you had that life-changing steak or perfect cocktail, but as you move on with normal life those memories can fade. A small notebook dedicated to your current trip is perfect because you can fill it with lists and memories specific to that time, then store it somewhere where you can reference it later. When you're in an exotic location, all of your senses feel heightened. You feel up for anything and are more open to trying new things. You notice the world around you when you step out of your daily routine. When you return from your trip, you're still riding the high of novelty and good memories. So act on those feelings! Whether it's something small like seeing your world through new eyes or something as big as signing up for a new class or even booking your next trip, take advantage of the way travel changed you. I know. This is the worst. Packing is at least exciting because you're about to go somewhere cool. Unpacking is just sad and a giant pain. But...there's nothing worse than a half-empty suitcase sitting on your bedroom floor for three weeks. You'll feel so accomplished if you clear out your suitcase, do your laundry, and get your home back in order. You don't even have to do it the moment you get home. Just within a day or two of your return. I don't know about you, but when I travel it throws off my digestive system. I'm a creature of habit, and eat the same thing every day when I'm at home. 1-2 shakes, toast, lots of fruit, some veggies, and a healthy-ish dinner. When I'm somewhere new, I don't have as much control over what foods are available. I'm more likely to try new foods, enjoy dessert, or have an alcoholic beverage. As I mentioned above, I'm probably not drinking as much water as I'm used to. It throws off my body and I start to feel sluggish and bloated. That's one positive thing about getting back home - you get back on the healthy eating train. My body craves vitamins, minerals, and fiber. I highly recommend adaptogens during and after travel, because they are herbs that help your body ADAPT to stress and normalize bodily processes. I've been taking extra servings of these adaptogens to help my body recover. Whether you write it down, say a prayer, or just think about the things you're grateful for, you'll start your day with a better mindset. Be grateful you had the chance to experience another part of the world. Be grateful you have a cozy home to come back to. Be grateful your friends and family support your travel. Find something, anything, to say thank you for. Instead of being sad that your trip is over or frustrated at the state of your house, you'll be looking for things that make your life wonderful. What do you do to recover from long days of travel? Any tips for getting back into your normal routine?